Absolutely stunning Aurelia gown from Alexandra Grecco label: size 10. Can easily be altered to suit your size if you are smaller. 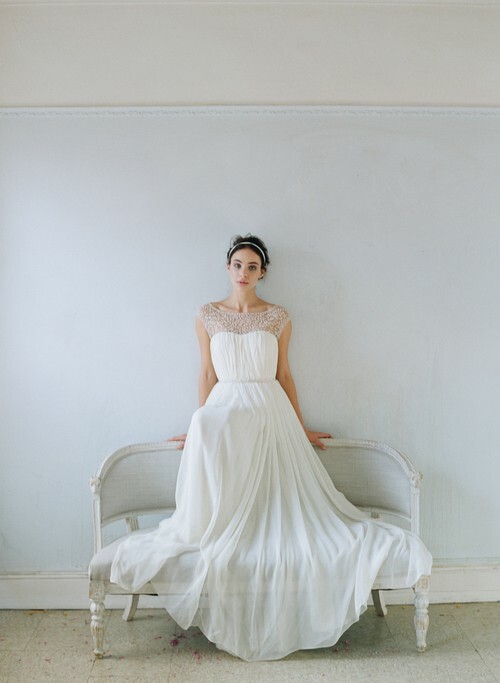 This style is classic and stunning for todays modern bride. Exquisite silk chiffon and with modest train. Diamonds and crystals on the bodice adds texture and sparkle to adorn the chest and back in such a beautiful way. Sadly, I am missing the little belt. But you can easily purchase one separately through Alexandra or another designer (even etsy!) Strapless or no bra is suggested. Can get dry cleaned if you'd like. This dress is for the ultra romantic bride-to-be!